WASHINGTON Secretary of State Hillary Rodham Clinton is pledging a full and open inquiry into the attack on the U.S. consulate in Benghazi, Libya, amid demands from Congress for speedy answers to questions about the security of the mission and concerns that the FBI investigation into the incident has been delayed. In Washington Wednesday, Clinton said that active efforts are underway to find out who was responsible for the attack and to bring them to justice. "There are continuing questions about what exactly happened in Benghazi on that night three weeks ago. And we will not rest until we answer those questions and until we track down the terrorists who killed our people," she said. She added: "Nobody will hold this department more accountable than we hold ourselves, because we served with and we knew the four men that we lost. They are not just names or profiles to us. They are our colleagues and our friends." 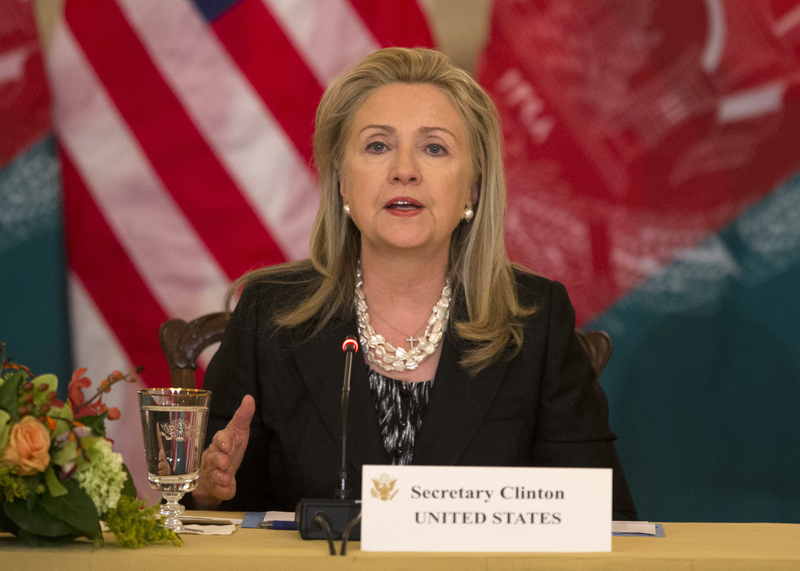 At the State Department with Kazakhstan Foreign Minister Yerlan Idrisov, Clinton was asked by CBS News' Margaret Brennan about a claim by congressional committee leaders that there were multiple requests for increased security in Tripoli and Benghazi from diplomatic staff there that were rejected. "It's essential that we go through all of the information and the entire context so that we can get a full and complete, accurate understanding of what happened," said Clinton. "I take this responsibility very seriously, and I believe that our diplomats and the American people deserve a rigorous, careful process. Now we are already working with congress and the relevant committees, and we will continue to respond to questions and requests in a cooperative way." An independent five-member board appointed by Clinton will begin this week looking at whether security at the consulate was adequate and whether proper procedures were followed before, during and immediately after the attack that killed the U.S. ambassador to Libya and three other Americans on the 11th anniversary of 9/11. "The men and women who serve this country as diplomats deserve no less than a full and accurate accounting wherever that leads and I am committed to seeking that for them," Clinton told reporters at the State Department on Wednesday. Clinton promised "a process that is as transparent as possible" although she stressed that "it will take time." Previous inquiries into attacks on diplomatic missions have taken months to complete. But faced with Republicans in Congress impatient for full details of any possible negligence before November's presidential election, Clinton pledged that the State Department would share information as appropriate with lawmakers as soon as possible. At the same time, she cautioned that the Accountability Review Board led by former chairman of the Joint Chiefs of Staff, retired Adm. Mike Mullen, should not be rushed to judgment. "I am asking the board to move as quickly as possible without sacrificing accuracy," she told reporters. "In the interim, we will provide as much accurate information to the Congress and the public."" "Over the course of this review, there will be naturally be a number of statements made, some of which will be borne out and some of which will not," Clinton warned. "I caution everyone against seizing on any single statement or piece of information to draw a final conclusion."